That’s the first thing out of my son’s mouth every morning…after school…and I’m ashamed to admit it, but he has even gone so far as to text me from class. Hubby will ask occasionally but that’s okay he’s a hard working guy and his toil puts food on the table so he is allowed to ask. Wait…before you jump! Yes, God’s provision puts food on the table, He also provides hubby employment. God absolutely provides for our family. Being blessed with the desire to prepare wonderful meals for my sweet family, I wanted to share some of our favorites from time to time. So…I created the “RECIPE” page on this blog. Some of the recipes are from friends…some are from family…some I made up…in a pinch I’ve done just that. I’m not ashamed to tell you that their have been times when our pantry was bare. I’m sure everyone has been there at one time or another…some more than others. You know what I’ve found? Its that when your at your lowest that God provides you with the most creative ideas. I’ve prepared some of the best meals out of little or nothing. Now mind you, not all of the “bare pantry” days were due to lack of funds. I will admit to you that without a doubt grocery shopping is my least favorite thing to do. In fact…unless I’m out of coffee 🙂 I will go as long as I can before I push myself through those sliding doors. So please…take one or two…or use them all! Enjoy and share. I would love to know what your family’s favorite meal is and what is the most creative meal you ever prepared? 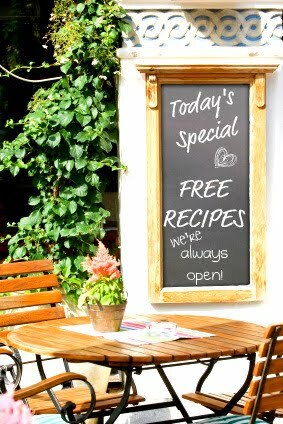 Where do you find the best resources for great recipes? Do you love to cook or dislike it terribly? My son wants to eat all the time too…but he's only 6! I love allrecipes.com online for special recipes…there's also a great cookbook called More with Less and another Amish cookbook, that I can't remember the name of right now. I like to cook…I miss it a lot…and mostly miss that I cannot prepare foods that would be healthy and my family would enjoy. I also miss that my children don't really have the opportunity to cook or bake, both of which I began at a very young age, because you can't have children in a State inspected kitchen. I'm in a transition right now. I just started eating vegetarian about 3 weeks ago and I'm at a loss for good recipe ideas. I refuse to eat tofu or soy. I want normal food! Anyway, it's going to be a process! I'm glad you created this tab, now I'll know where to turn when I'm out of ideas. Better keep it stocked with good ideas. I love cooking – and eating for that matter! I'll be keeping an eye on your recipes!